Queerphobia in the workplace exists as a microclimate of the queerphobia we experience in wider society. As a queer femme woman at work, as elsewhere, in each new environment I am assumed to be straight, my sexuality erased and delegitimised until I cave into repeatedly outing myself. Then I am often sexualised, presumed to be hypersexual and interested in dating every other queer woman in the vicinity. In this way an office exists as a handheld mirror of the broader unconscious biases faced on the street, amongst friends and in the media. In fact, scrap that. Unpicking queerphobia at work is the monumental issue in my liberation. Perhaps it is time we start tackling queerphobia in the workplace, not as a reflection of the bigger issues, but as the defining manifestation, where institutional oppression is bred alongside everyday macroaggressions. After all, we spend a great proportion of our lives at work, so we need to make the changes we want to see in the world happen here too – or even first. 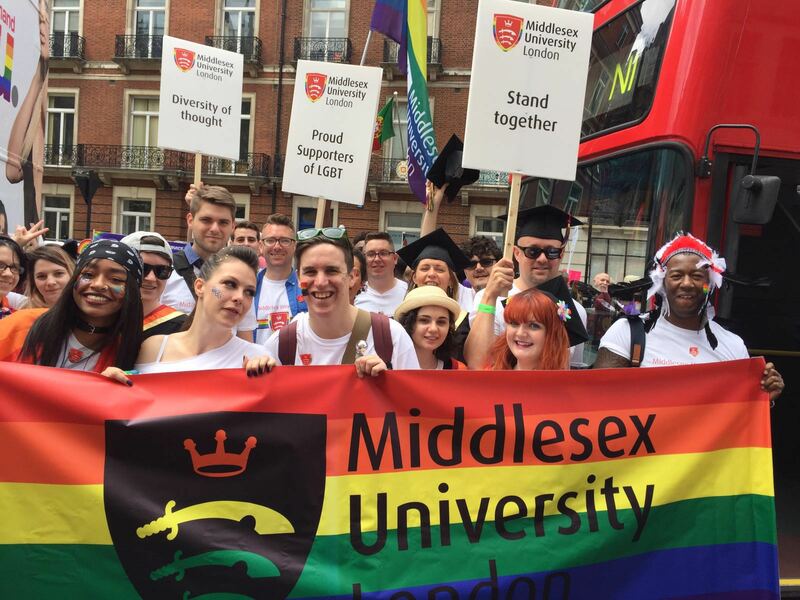 At Middlesex University we work within and alongside the student movement, one of the most progressive forces for change in the world. This year the National Union of Students (NUS) sees the introduction of the first ever national Trans Officer alongside the two LGBT+ Officers (one Open Place and one Women’s reserved place). The campaigns these Officers lead, alongside our own LGBT Students Group, fight tirelessly for the rights and full liberation of LGBT+ students at University and in the wider community. These are huge steps forward for the student movement in the face of a Tory-DUP deal, the deportation of gay asylum seekers who don’t ‘look gay’ to countries where homosexuality is illegal, and the atrocities of concentration camps for gay men in Chechnya. Students continue to stand up, protest and be heard on matters of injustice, inspiring us all to fight issues, from the big and global to those which seem every day and maybe even insignificant. And yet, even in this rapidly progressing working environment, where we can learn a lot from our student counterparts, we are not immune from workplace discrimination and harassment. It is important to remember that every prejudice we face, no matter how small it may seem, is legitimate and unacceptable if it makes us feel uncomfortable. I feel lucky to work in the student movement, at a University whose senior leadership has set out our upcoming priorities in our new strategy, including a real dedication to diversity and inclusion. For example, Sophie Bowen recently sent round a reminder for all staff to complete our compulsory Equality, Diversity & Inclusion training. But we still all have far to come at Middlesex University. Our training has a long way to come – it only offers a basic overview on LGBTQ+ issues in conjuncture with other equality and diversity issues. We would need at least a whole online module on LGBTQ+ issues to even begin to understand the wide array of identities and complexities, and there are many more concrete changes we must make at work, from our recruitment processes to our office culture. We are all constantly learning and unlearning our unconscious biases, and must understand that if we are called out on our behaviour it is for the benefit of our whole organisation and wider society – it isn’t a personal criticism. As LGBTQ+ people we must liberate ourselves, or else it isn’t true liberation, and a real ally’s work is to work out how to support that. 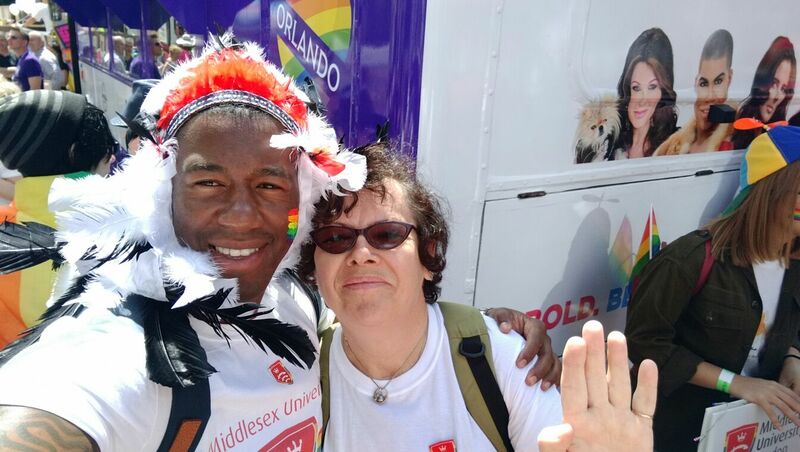 We must celebrate our LGBT+ Staff Forum this week on the most diverse array of Pride events we have seen yet. I am proud to part of an organisation that screened Moonlight with a panel Q&A from BlackOut UK, truly foregrounding the black male gay experience. We have offered a Parade placard making session for staff and students and two of our staff members are even taking part in a Pride Boxing competition. Allies must continue to support this work by listening, learning and amplifying the voices of our LGBT+ staff and students. We are living in a time of rapid change, and we have the opportunity to shape our experience for better. The work starts here.